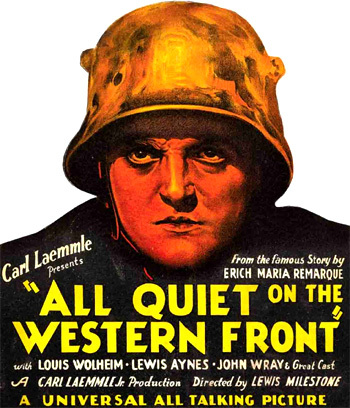 All Quiet on the Western Front (1930) is the first major anti-war film of the sound era, faithfully based upon the timeless, best-selling 1929 novel by Erich Maria Remarque (who had experienced the war first-hand as a young German soldier). The film was advertised with the brooding face of one of the young German recruits sent into World War I. The landmark, epic film, made on a large-scale budget of $1.25 million for Universal Pictures (and studio production head Carl Laemmle, Jr.), used acres of California ranch land for the battle scenes, and employed over 2,000 extras. From four Academy Award nominations, it won the Academy Award for Best Picture (the third winner in the history of AMPAS) and Best Director (Lewis Milestone with his first sound feature), and it was also nominated for Best Writing Achievement (George Abbott, Maxwell Anderson, and Del Andrews) and Best Cinematography (Arthur Edeson). It was a critical and financial success, and probably the greatest of pacifist, anti-war films - the grainy black and white film is still not dated and the film hasn't lost its initial impact. The episodic film is still one of the few early sound films that modern audiences watch. However, it was criticized as being propagandistic and anti-militaristic. For its perceived anti-German message, it was denounced by the Nazi government in Berlin of the 30s and subsequently banned. The film was made only a dozen years following the end of the Great War, and the memories of the war were still fresh. Before it, other war films in the silent era had done very well: King Vidor's The Big Parade (1925), Raoul Walsh's What Price Glory? (1926), and William Wellman's Wings (1927). Coming as it did with the dawning of sound pictures, its directors and producer, and at least one cast member went on to future fame: Carl Laemmle, Jr. (producer), Lewis Milestone (director), George Cukor (credited as dialogue director), and Fred Zinnemann (an extra). Janitor: No, from the French. From the Russians we capture more than that every day. As he opens the door, spike-helmeted German soldiers in 1914 uniforms march off to war to the nationalistic sounds of martial music (played by a military band), and the sight of flags flying and cheering crowds. The normal routines of life continue - however, life will be changing. A meek postman, Himmelstoss (John Wray), delivers the mail, but he will soon be joining the reserves (and will play a significant role in the film). You are the life of the Fatherland, you boys. You are the iron men of Germany. You are the gay heroes who will repulse the enemy when you are called upon to do so. It is not for me to suggest that any of you should stand up and offer to defend his country. But I wonder if such a thing is going through your heads? I know that in one of the schools, the boys have risen up in the classroom and enlisted in a mass. But, of course, if such a thing should happen here, you would not blame me for a feeling of pride. Perhaps, some will say that you should not be allowed to go yet, that you are too young, that you have homes, mothers, fathers, that you should not be torn away. Are your fathers so forgetful of their Fatherland that they would let it perish rather than you? Are your mothers so weak that they cannot send a son to defend the land which gave them birth?! And after all, is a little experience such a bad thing for a boy? Is the honor of wearing a uniform something from which we should run? And if our young ladies glory in those who wear it, is that anything to be ashamed of? I know you have never desired the adulation of heroes. That has not been part of my teaching. We have sought to make ourselves worthy and let acclaim come when it would. But to be foremost in battle is a virtue not to be despised. I believe it will be a quick war, that there will be few losses. But if losses there must be, then let us remember the Latin phrase which must have come to the lips of many a Roman when he stood embattled in a foreign land: 'Dulce et decorum est pro patria mori.' 'Sweet and fitting it is to die for the Fatherland.' Some of you may have ambitions. I know of one young man who has great promise as a writer, and he has written the first act of a tragedy which would be a credit to one of the masters. And he is dreaming, I suppose, of following in the footsteps of Goethe and Schiller, and I hope he will. But now our country calls! The Fatherland needs leaders!! Personal ambition must be thrown aside in the one great sacrifice for our country! Here is a glorious beginning to your lives! The fields of honor calls you. Inspired by the uplifting rhetoric of their teacher, the boys rise one by one to their feet, promising to go. The group of German school boys enthusiastically cheer and volunteer to enlist for service in World War I. The young men who will soon become the central characters of the film are introduced. Seven naive boys (including Paul Baumer (21 year old Lew Ayres in a star-making role) and his friends Kropp, Leer, and Kemmerick), each young and impressionable, are recruited and trained to fight for the glory of the fatherland. Arriving in training camp, the young boys expect war to be a great lark. They enthusiastically talk about fighting, using bayonets, riding cavalry, or killing the enemy, but soon, the schoolmaster's words fade from their memories. They are trained by drill sergeant Himmelstoss, the ex-village postmaster who has become a disliked, sadistically brutal commander. During training, he proves to the recruits how they must obey his commands: "You're not much to begin with, but I'll do my best," he threatens. The first thing to do is to forget everything you ever knew, everything you ever learned - Forget! See. Forget what you've been, and what you think you're going to be. You're going to be soldiers, and that's all. I'll take the mother's milk out of you, I'll make you hard-boiled. I'll make soldiers out of you, or kill you! Himmelstoss takes pleasure during their training days in ordering the recruits to march into mud, fall down to the ground and crawl forward in the muck. After being dismissed one day, a recruit bitterly complains about Himmelstoss: "Oh that swine! Means we get no time off. Four hours to get ready for inspection." After they have finished their training camp drills, they are sent to the front, but not before getting revenge on Himmelstoss on their final night by dumping him in the mud. On the way to the front lines after being ordered there by rail, the new recruits disembark in a shell-torn French town. There, they hear the scream of enemy shells for the first time. The Germans are already suffering from lack of supplies and food. The raw recruits are greeted by disillusioned, cynically-stoic veterans of the war. Inside a deserted factory, the seasoned old-timers Westhus (Richard Alexander), Detering (Harold Goodwin), and Tjaden (George "Slim" Summerville) meet the "green" soldiers: "Here's some more. Fresh from the turnip patch." New recruit Paul asks the veterans: "You see, we haven't eaten since breakfast, we thought maybe you could tell us what we ought to do about it." Providing comic relief, Tjaden replies: "Eat without further delay." And "it's a bad town to bring an appetite to, soldier. We've been here since yesterday morning and we've been living on a bale of hay and razor blades." They tell Paul how another front-wise career veteran Sergeant Katczinsky or "Kat" (Louis Wolheim) can always locate food if there is any to be found. In a dramatic entrance, the incomparable Katczinsky arrives with a pig over his shoulders. Obviously, he has learned how to live amidst the horrors and deprivations of war. He instructs the young recruits: "Some time, I'm going to take one of you volunteers apart - find out what makes you leave school and join the army. Hey, this is no parade ground." The boys must trade not paper money, but cigarettes, cigars, soap, cognac, and chewing tobacco for something to eat. Soon, everyone is devouring the whole pig. Never mind. It's happened to better men than you. And it's happened to me. When we come back, I'll get you all some nice, clean underwear. He instructs them in proper protection from shell fire: "That cannon shell you don't have to pay much attention to. Those big fellas just make a lot of noise and land about five miles behind the line. The things we've got to watch out for are them black ones. They don't give you much warning...Mother Earth - press yourselves down upon her. Bury yourselves deep into her. Just keep your eyes on me. When you see me flop, you flop, only try to beat me to it." In their first night at the front, a bombardment erupts while they are stringing up barbed wire. One of the boys is blinded by shell fire and screams: "My eyes! I'm blind. I can't see." He staggers and is killed when he runs wildly toward the enemy line and into the path of machine-gun fire. The students learn that war is not noble - it is no more than cruel death and destruction. Katczkinsky explains how foolish it was for one of the recruits to go and retrieve his friend - the corpse of the dead man. Soldier: (shocked) Dead. He's dead. Katczinsky: Why did you risk your life bringing him in? Soldier: But it's Behm, my friend. Katczinsky: (admonishing) It's a corpse, no matter whose it is. Now, don't any of ya ever do that again. The next day, Katczinsky tells the exhausted Paul about the war and the interminable march they are about to take to another "party": "And this one is gonna last a long time. Come on. Here we go." For days on end, they sit terrified, hungry, disheveled and tired in a dug-out underground bunker, hearing the ever-present sound of bombs exploding above them. The anti-war message is made clear through their first experiences under fire. One shell-shocked soldier suffers nightmares of the horrors of claustrophobic trench warfare. Iron-willed Katczkinsky strikes another one who has a nervous breakdown under the strain. When part of the bunker collapses after a bomb hits, an hysterical Franz Kemmerick (Ben Alexander) runs outside and is struck in the leg by fire. Rats invade their quarters. Suddenly, the bombardment eases and the men run outside to take their positions in the trench. (Paul is easily distinguishable, because the spike on his helmet has been shot away.) The mobile camera travels over the heads of the men in the trench (evidently one of the earliest uses of a crane shot in any film). In an inspired, realistic battle scene in no-man's land [modern-day war films have often imitated it], the camera rapidly moves across and in front of the French infantry charge across the no-man's land. Their charge is intercut with short cuts of German machine gunfire to hold them back and cut them down. At one point, a grenade explodes in front of a charging French soldier who is approaching some barbed wire and obliterates him. When the dirt and smoke clears, only his amputated hands are left gripping and clinging on the wire. Paul turns, writhes, and cringes in horror against his rifle stock. The pace accelerates and the speed of the charge increases as the French front line gets closer. The camera shoots its images like a machine gun, mowing down the incoming French troops (from left to right) in the useless charge - scores of them drop under the fire. However, enough of the French get through and they leap into the German trenches - there is fierce hand-to-hand combat. The Germans must retreat from their position to a trench further back. The bodies of thousands litter the field of battle. Senselessly, many of Paul's boyhood friends are killed. And then, the French are driven back in a German counter-attack. As the Germans approach the French trenches, they are mowed down by French machine gun fire in a moving camera shot (from right to left) - the sequence of shots during the counter-attack are almost identical to the shots of the earlier French attack. Both sides are left in a stand-off AND in the same trenches where the battle began. After the battle, Katczinsky reports that almost half of the company have been lost: "There's 80 of us left. The rest is in dressing stations or pushing up daisies." Ironically, the cook, who has prepared a meal for 150 soldiers, is upset that he wasn't notified that there would be fewer soldiers eating. The troops are fed and given a day's rest, but they expect to return to the front the following day. Tjaden: Oh, that's it. I shouldn't be here at all. I don't feel offended. Katczinsky (joking): It don't apply to tramps like you. Tjaden: Good. Then I can be going home right away...The Kaiser and me...Me and the Kaiser felt just alike about this war. We didn't neither of us want any war, so I'm going home. He's there already. Soldier: Somebody must have wanted it. Maybe it was the English. No, I don't want to shoot any Englishman. I never saw one 'til I came up here. And I suppose most of them never saw a German 'til they came up here. No, I'm sure they weren't asked about it. Another Soldier: Well, it must be doing somebody some good. Tjaden: You leave us out of this. Katczinsky: I don't see that. The Kaiser's got everything he needs. A Third Soldier: And manufacturers. They get rich. I'll tell ya how it should all be done. Whenever there's a big war comin' on, you should rope off a big field (and sell tickets). Yeah, and, and, on the big day, you should take all the kings and their cabinets and their generals, put them in the center dressed in their underpants and let 'em fight it out with clubs. The best country wins.